PSE chuck and Wire-EDM tooling is well designed regarding the precision and stability. Every component is hardened and stainless. Adaptations for combatible interfaces are practicable. Sets for other wire-EDM machines are available on request. PSE chuck is available for all systems. The right equipment according to the field of application. With a well thought out combination of basis equipment and pendendulum holder 3D, you are able to clamp all conceivable workpieces. Adaptations on existing systems are practicable. PSE clamping systems flexibilise and productivise WEDM installations. Our program comprise system components for all user. 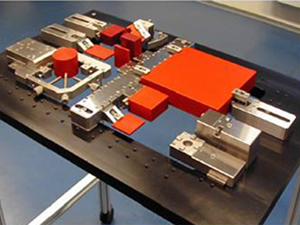 PSE clamping systems improve the productivity and flexibility of WEDM machines.